Jane Irish, 9, sings and plays "Rockin Robin" on her ukulele for the next episode of "Once Upon a Time," the locally produced children's television show. Belfast Free Library children's librarian Erica Rubin Irish (left) leads a movement rhyme with her daughter Jane Irish, 9, of Morrill and Judson Thomas, 9, of Montville. Ned Lightner, station manager for Belfast Community Television, got all the action of tape for an upcoming episode of "Once Upon a Time," a locally produced children's television show. Ned Lightner, station manager of Belfast Community Television, records 9-year-old Judson Thomas of Montville playing a song during a taping of the children's story time show "Once Upon a Time." 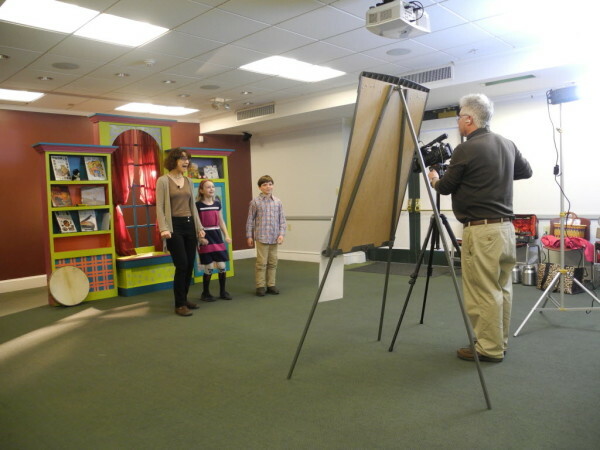 BELFAST, Maine — Backstage at the Belfast Free Library during a recent taping of Belfast Community Television’s children’s program, the scene was energetic, creative and more than a little chaotic. “Quiet on the set!” Ned Lightner, the station manager for BCTV and the director of the program, exclaimed from behind his video camera. And with that time-honored phrase of the show business world, the cameras were rolling and the talent jumped into gear. 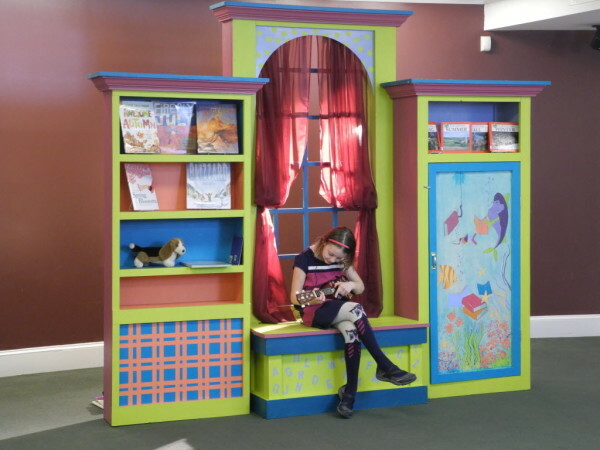 “Once Upon a Time,” co-hosted by local musician Jennifer Armstrong and Belfast children’s librarian Erica Rubin Irish, is a half-hour show featuring songs, movement games, special performances by child guest stars and stories read aloud. It’s broadcast to about 2,000 households in Belfast, but the audience doesn’t end there. It’s also shown on other community television channels around the country. The show’s largest audience is in Tampa Bay, Florida, where 250,000 people can watch it. It has also been picked up by community television stations in Wisconsin, Minnesota and Massachusetts, according to Lightner, who said some of the elements of the program are not specific to Belfast. Rubin Irish, who started the show in early 2013 when she was the children’s librarian at the Carver Memorial Library in Searsport, said she, Lightner and Armstrong have produced 13 shows in the last seven months. The show has been a true community project, as Belfast-based set designers John and Elaine Bielenberg volunteered to build the set and the children who are the special guest stars come from nearby towns. Her favorite part of “Once Upon a Time” is the guest stars. “I wanted kids to see kids their own age or a little bit older than them perform and be inspired,” she said. 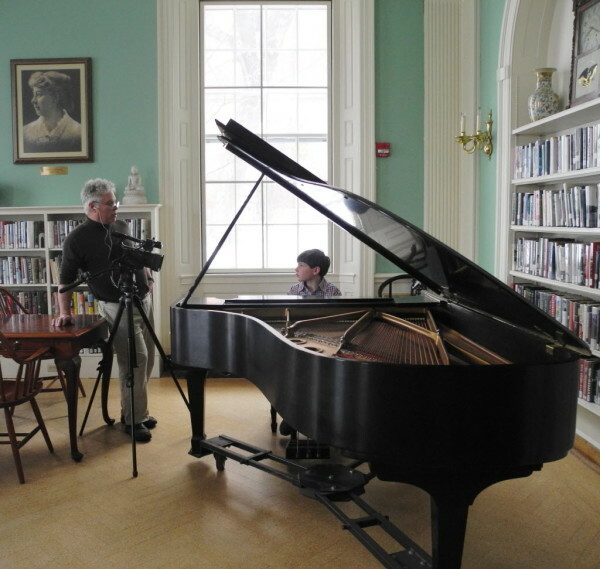 As Judson got ready to play a well-rehearsed piano fanfare on the grand piano in the Belfast Free Library’s Gammans Room, his mom, Erika Latty, said he has been looking forward to being on the show. Jane Irish, who practiced a lot before she played and sang “Rockin Robin” on her ukulele for the show, said she thought the experience was great. Her favorite part was watching her friend Judson play the piano. When asked if other kids who like performing might enjoy being on “Once Upon a Time,” Jane did not hesitate. To watch “Once Upon a Time,” visit vimeo.com/album/3476245.